Two orphans in captivity fight their oppressors in a hope to free themselves and avenge the murders of their parents. But the love they are hoping to live is shattered into pieces as the past caught up with them. How will they react to a situation that jeopardize their love life? Suspense, a well thought out mystery plot, violence, adventure, action, love and hope fill fascinating novel. 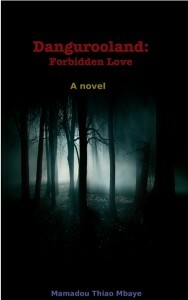 Forbidden Love relates the story of two young orphans named Mona and Akil. When Guntaw takes power in a violent and bloody coup and auto-proclaims himself as the new ruler of Dangurooland, life becomes unbearable for the people as oppression and injustice set in. After years of oppression, people start to leave Dangurooland in a massive exodus to settle in “The Jenden Slopes” to preserve their dignity and freedom. Furious, Guntaw orders his soldiers to burn “The Jenden Slopes” to the ground, captivate young boys as potential soldiers, and annihilate men, women and girls. Our HEROINE, 7 year-old Mona and one of only two survivors, is mistakenly thought as a young boy. She is taken captive and brought back to Dangurooland as a slave worker. Now, at 18 years of age, she lives with Zora who happens to be the sister of the army general who led the massacre of “The Jenden Slopes”. Mona lives nightmare after nightmare as Zora constantly sends her to far away places to collect medicinal leaves from mysterious trees. One of those trips will take her in an adventurous journey to the mysterious, legend-ridden Lundumburg. As she painfully search for this mysterious place, she encounters evil and powerful shape shifting beings called JOMIES who try to kill her. Will she succeed in finding Lundumburg? Will Mona and Akil avenge their parents’ murders? Suspense, a well thought out mystery plot, violence, adventure, action, love and hope fill this fascinating novel.